Lucknow, Feb 11: Congress president Rahul Gandhi along with his sister and Congress General Secretary for UP East Priyanka Gandhi Vadra and UP West General Secretary Jyotiraditya Scindia were given a rousing welcome at the Choudhury Charan Singh airport on Monday. The Congress workers and leaders went berserk on seeing Priyanka and the security personnel had a hard time to control them, when the leaders arrived at around 1245 hours, about 45 minutes late. 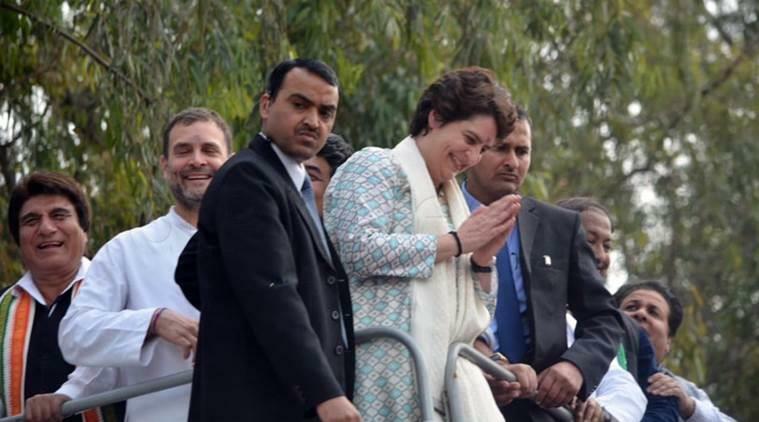 Priyanka, under tight security cover immediately left for the road show but she did not disappointed the workers and waved her hand to give a positive response to the workers assembled at the airport since early morning. UP Congress general secretary and in-charge of Lucknow, Vinod Kumar Mishra, who led the welcome at the airport told TNN that such mass crowd was never seen in the past in any event. Several senior UP Congress leaders including Maroof Khan, Amarnath Agarwal, Sidtharthpriya Srivastava and others welcomed the leaders at the airport. Priyanka along with Rahul and Scindia , will hold a 14 kilometer long road show in the city and will end at the state party headquarters in the late afternoon. Priyanka is also slated to address the workers in Lalbagh during his road show, party sources here said. Meanwhile, BJP has slammed the Congress on the road show saying it is an effort to cover up their family corruption.
" They're calling this road show but BJP sees this as 'Chor machaye shor'. Gandhi-Vardra family is out on bail. They can't hold road show but a 'Chor show'. People of UP,especially Lucknow,will come to see corrupt faces of those who looted Rs 12 Lakh Crore of this nation," commented UP government spokesperson and state health Minister Sidharth Nath Singh here on Monday.